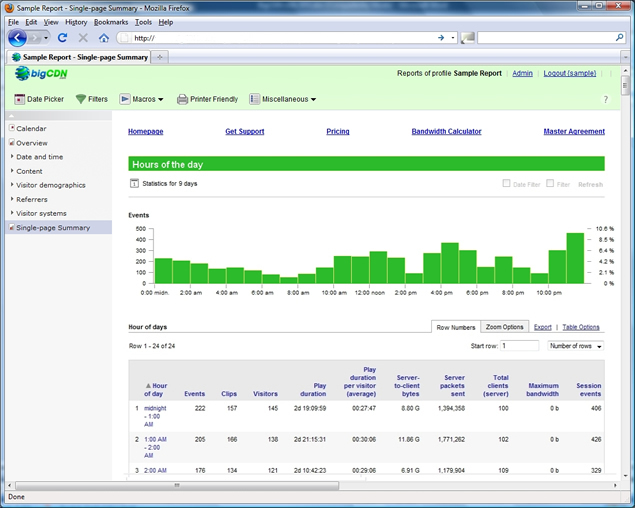 Unlike other providers bigCDN includes Advanced Statistics Reporting for free, Multiple CDNs & Formats all in one place. We've always flexible to our customer's requirements and can pull any type of logs from other places like your website. So you want to know how successful your content is with your users? The usual measurement methods just aren’t good enough. The bigCDN reporting portal uses statistical data not available with standard web stats e.g. Find out who had watched what from where and for how long. Our portal can give you all this in the detail you need. To find out more and to request an example Stats Portal login, please contact us. This entry was posted in General CDN and tagged Advertising strategies, bandwidth, Content Management, geographic location, optimized playlists, statistics reporting, Stats Portal, superior user experience, viral marketing, Visitor figures. Bookmark the permalink.